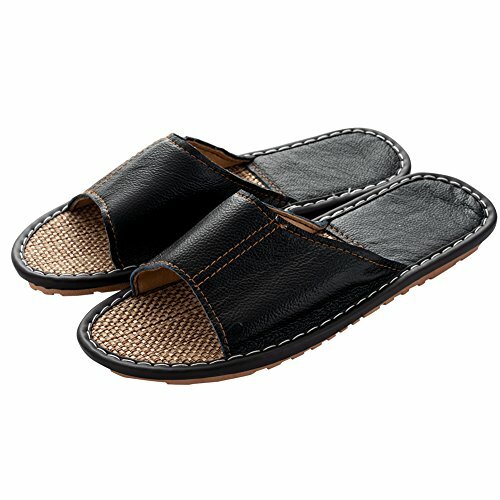 Mens Slipper Indoor Open Toe Slip On Slippers Non-Slip Leather Sandals by handrong at SCRHI. Hurry! Limited time offer. Offer valid only while supplies last. ◆ Material: Made of high quality leather, soft cotton flax, and TPR, fine edge, meet the needs of the family. Share this slipper with families to enjoy relaxing life. ◆ Non Skid Soles: Patterns on the bottom of slippers, increasing friction, wear resistance and durable TPR soles, no damage to floor. Lightweight and comfortable in wear. Give you a pleasurable walking experience. ◆ Occasions: Quite suitable for home, indoor bedroom, SPA, hotel, plane, train, travel, bathroom, living room, gym, leisure, and so on, relax yourself wherever you go. ◆ Great Gifts: Perfect for Valentine's Day, wedding, christmas, holiday, housewarming gifts, etc. Summer, spring, autumn and winter use. ◆ Size: For men size 8.5 - 9. *Note: It is normal phenomenon that slippers have smell, non-toxic, wash them can disguise the smell, please understand. If you have any questions about this product by handrong, contact us by completing and submitting the form below. If you are looking for a specif part number, please include it with your message.